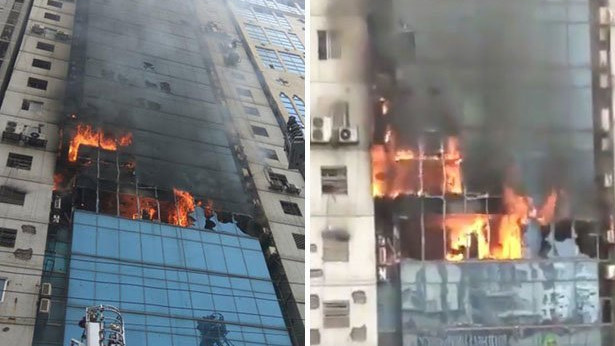 AKIPRESS.COM - A huge blaze has broken out in a high-rise building in an upmarket commercial area of the Bangladeshi capital, Dhaka. Fire crews are at the scene, backed by members of the navy and air force, BBC reported. It is thought dozens of people are trapped inside the 19-storey office block in Banani, and some reports say some people have been seen jumping out of the building. A massive blaze in Dhaka's old quarter last month killed at least 78 people and injured dozens more. Local media said people were seen shouting for help from windows and at least six people jumped out of the burning building. "Nineteen fire-fighting units are working at the scene. Bangladesh navy and air force have also joined to fight the fire," duty officer Mohammad Russel from Dhaka's central fire service control room is quoted as saying by AFP news agency.